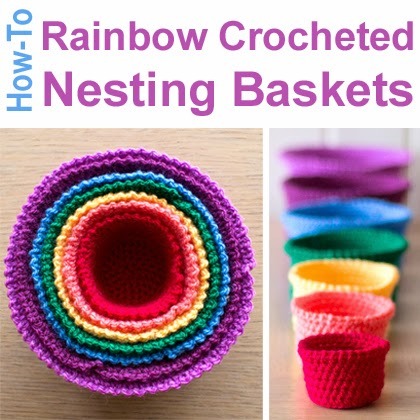 In this tutorial, you'll learn how to make a set of seven rainbow nesting baskets. These baskets are great for storage, but they're also perfect for teaching your little ones about colour and shapes! They can keep themselves busy for hours as they discover how to fit all the baskets together. If you’ve always wanted to learn how to crochet, follow our series of Crochet Fundamentals. This pattern uses US terms and stitches include single crochet (sc); half double crochet (hdc); inc (increase); slip stitch (sl st) and chain (ch).